Mango Tango Agastache (agastache aurantiaca 'mango tango') PP28,747 - Also called hyssop. One of the easiest perennials to grow. Heat and drought tolerant. Attracts hummingbirds, bees, and butterflies. 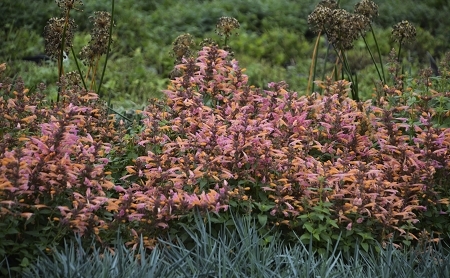 This compact selection forms a dense, rounded clump of aromatic, green foliage topped with spikes of mango-orange flowers held in dusky rose calyxes. Blooms over a long time period Summer through Fall. Grows to a height of about 18". Deer resistant, needs plenty of sun. Perennial zones 6a - 9b. One live plant in 3" container.